Build a common vision across your school and district. These sessions examine how a standards-based system helps promote the success of all students. Your leadership and district coaches will get hands-on support and guidance. 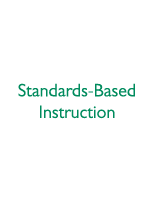 Explore standards-based instruction, focused teaching, and in-class interventions. Learn routines to differentiate instruction and improve classroom management. Create a group of laboratory classrooms that use, examine, and refine best practices.